Classes for the Certificate IV in Training and Assessment have kicked off again in Nhulunbuy with a very good turn-out. Interest has been high with a good number of enrolments in both workshops with Chris Dixon and the weekly classes with Rosa Casey. Peter Vincent also has been in town to run the AIM/CDU short course ‘Dealing with Difficult People’. The course was well received with interest in having other workshops held here in the future. The number 2 Mobile Adult Learning Unit (MALU 2) was in Nhulunbuy recently for a service before heading off for Yilpara ready for classes to begin. 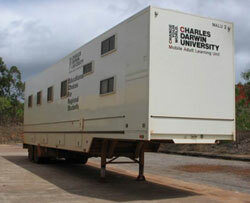 Although MALU 2 was in the university car-park, interest in it has been high with people commenting on what a great idea it was to have a mobile classroom allowing remote communities to benefit from training. A local transport company have been enlisted to assist CDU in moving MALU 2 around East Arnhem Land. 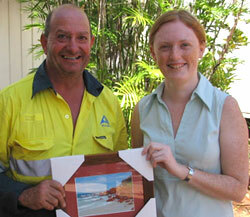 Peter White, Nhulunbuy’s welding lecturer, has left after 16 years of casual teaching. Peter began work with the former NTU in 1991 after moving his family to Nhulunbuy to work for Nabalco (now Alcan). Peter, along with two other men, assisted in organising equipment to establish the welding workshop and to start classes. The students at the time were given exercises to produce the work benches and other items in the workshop. Peter says he has seen about 1000 students through the workshop over the years and has an impressive success rate with students passing some very high certificate training. Peter is now living near the bigger waves in sunny Queensland. We wish him all the best with his new job. Picking up from where Peter has left off is Trevor Deane. Trevor has previously taught with CDU and has come back to work with us again. While saying goodbye to Peter, Nhulunbuy staff also have welcomed Tanya Hague to the office. Tanya comes from Halls Creek, Western Australia, where she had a teaching position with a local TAFE. Tanya will begin full-time in term 4 and will deliver business and information technology certificates. Rosa Casey and Maria Logan have shifted sideways with their lecturing roles at CDU. Rosa has moved from Children’s Services and is now running the Training and Assessment course while Maria has moved from Financial Services to Children’s Services. 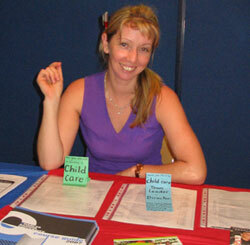 The 2007 Careers Expo was held in Nhulunbuy in late August. Sarah Hanks, coordination officer, and Don Christopherson, from Palmerston’s IASU, were on hand to offer course information to potential students. Interest was good with particular interest in sports and marine biology courses. Early August saw the Garma Festival held at Gulkula near Nhulunbuy. The Vice-Chancellor, Professor Helen Garnett, came to town and popped in for a staff visit as did Paul Fitzsimons, Ian Hutton, Robyn McDougall, Camille Lew Fatt and Kath Martin. Other visitors during the past few months include Ann Goodwin, Bronte Cooper, Isabelle Cooper, Peter Rose and Gavin Clark.